Bible Cartoons: 3 John goes green! A bad leader rises up! 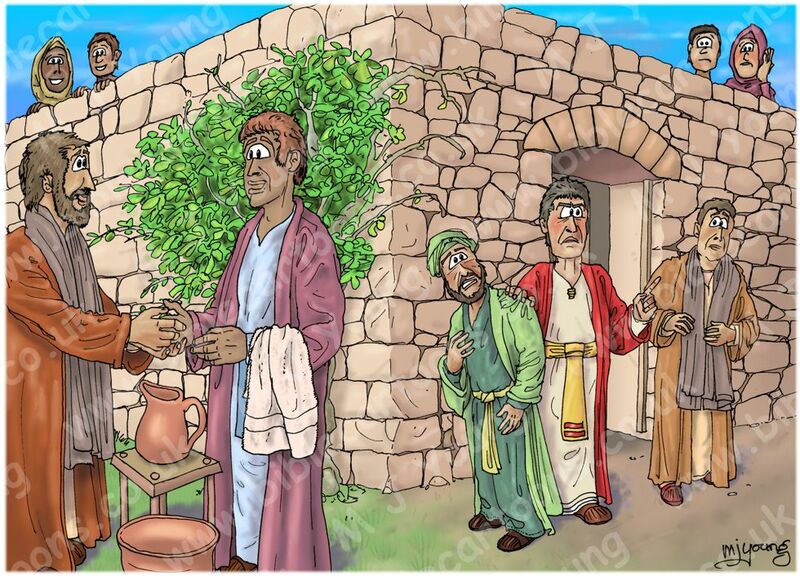 I have just completed my very first Bible Cartoon for the New Testament book of 3 John. That’s all the “John’s” done now, only the book of Jude left to draw a Bible Cartoon for & then I’ve done at least one Bible Cartoon for each of the 66 books of the Bible. The scene shows what happens in a church congregation when a person ascends to leadership who shouldn’t have! Diotrephes was the name of the guy who wanted to lead the church. He wanted to be the leader & it seems he gradually put a choking hold on the whole church. He didn’t like travelling preachers & not only did he tun them away, but he put people out of the church who wanted to help them too! Not a very welcoming or accommodating attitude huh?! I do hope the apostle John (who is credited with writing the letter we call “3 John”) visited that local church & had a word with Diotrephes. He said he would (in 3 John 1, verse 9) & it sounds like Diotrephes needed a strong reminded that leaders are there to serve the church, not lord it over them. Love, kindness, vision & keeping in step wit the Holy Spirit are amongst the necessary requirements of a good leader. It sounds like Diotrephes had few of these characteristics. My goal is to turn the remaining red boxes (on the BC website’s “Search by Bible Book” page) green before Christmas. A red box indicates I haven’t drawn any Bible Cartoons drawn for that book, whereas a green box shows I’ve drawn at least 1 cartoon for a particular book of the Bible. There is only 1 book which is red now, & that’s Jude in the New Testament. I start on that illustration today, so I’m on target!